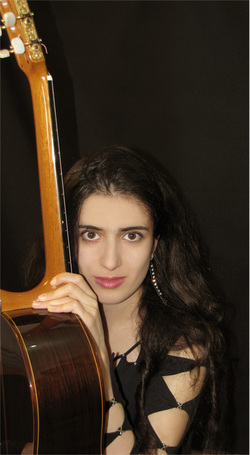 Lilit Mardiyan took her first guitar lessons at the age of 8 under direction of Armen Gevorgyan. In 2001 she graduated with honors H. Danielyan School of Arts. In 2002 she received 1st Prize in 7th International Youth Classical Guitar Competition in Sinaia (Romania). In 2003 entered Yerevan State Conservatory (class of Hakob Djagatspanian). In 2004 she has got the 2nd Prize in Stafford Classical Guitar Recital Competition (England). In 2007 she has graduated with honors from Yerevan State Conservatory. In the same year she was a semifinalist in GFA 25th International Solo Guitar Competition (Los Angeles, California) and entered USC Thornton School of Music, Graduate Certificate program (William Kanengiser's class). In 2009 she received the1st place in Armenian Allied Arts Association Competition, Senior division and the 2nd place in ASTA (American String Teachers' Association) California Competition. In December she graduated from University of Southern California and returned to Armenia. In 2013 she has entered and in 2015 has graduated with Master of Music degree from the Yale School of Music (Benjamin Verdery's class). She has performed in the festivals and concert series in Saint Petersburg (Russia), Sochi (Russia), Yerevan (Armenia), Athens (Greece) Friedrichsrode (Germany), Reifenstein (Germany). Collaborated with Orchestra of State Hermitage, conductors Karen Durgaryan and Federico Mondelci.